I've only used this product a few times but I just don't like it. It needs a good shake before you use it, which is fine, but the packaging is messy because it's so runny. Also it never dries down, it stays oily all day. What really turns me off about this product is that itâ€™s really runny. This product is very runny, but the coverage is great. Absolutely love this sunscreen. I don't feel any greasiness at all. Runny straight out of the tube but actually spreads on very smooth. Powdery, no shine finish and dries light which leaves me forgetting that I even have it on...unlike all other sunscreens I've tried on my face. The tint is not dark or thick enough to rely on as a concealer or foundation. But it does the trick in cancelling out any white casts that a lot of natural sunscreens contain....which also makes it perfect for any skin tone. Can you tell I really love this sunscreen!? MAKE SURE YOU SHAKE THE TUBE! This has a weird texture...almost like oil. If you apply the whole 1/4 tsp at once it takes a long time to dry/absorb so I recommend applying in intervals and letting it dry before applying more. Kind of annoying. Once it's absorbed tho, it feels like I have nothing on my skin! I can apply makeup on top with no issue. Slight creasing around my eyes by the end of the day but not too bad. And the tint is barely noticeable, it just makes my skin look less red, like a no makeup, makeup look. The best green suncreen I've tried so far. Non-greasy sunscreen! I don't love the smell and it's hard to get the right amount out of the tube, but other than that it's definitely the best face sun screen I've ever purchased. Honestly I don't love it. It's super watery or oily and it really doesn't offer much coverage at all. I'm actually really disappointed that I didn't love it! The sunscreen smells really nice. Make sure you shake the bottle before use. It is a little oily but it doesn't clog my pores. There's little tint which I like as it leaves my skin with a little glow. I will definitely purchase again. I really like this sunscreen. it doesn't really do anything to even the skin tone, but it doesn't whiten either. It's great under foundation or alone. This is a wicked product! Be sure to shake before using. It does come out â€œliquidyâ€� (a little does a LONG way) and once applied to the face and neck, feels silky smooth, not at all oily! I often wear it alone with a stick foundation over imperfections. It smells AMAZING! Has protected my skin from the sun, no burns so far! Highly recommend! Very nice subtle coverage. Definitely need moisture cream underneath. Only negative is I've yet to be able to dispense the right amount. I'm aways discarding the excess. I seriously love this sunscreen. It's the first one I've found that doesn't clog my pores and doesn't feel greasy. Easy to apply. 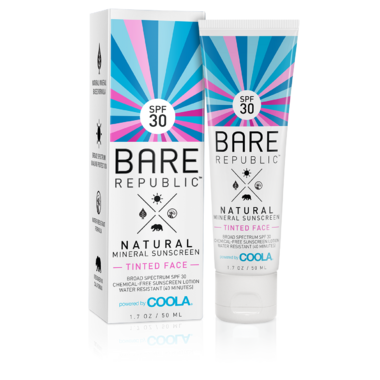 Not as tinted as I expected but it's not white, which what I wanted in a natural sunscreen. This one's a keeper. This sunscreen is great! It goes on smooth and soft and it doesn't feel tacky or gross. I actually like using it. It is quite runny and thin but most importantly, it won't leave white streaks on your face. Also the tint isn't really visible but I didn't mind. I really like this! It doesn't leave a white cast but doesn't give me any colour either. I definitely wouldn't count in it to replace foundation. It goes on silky smooth, however, and drives down to a matte finish quickly. This sunscreen sounded so good but unfortunately my skin reacted badly to it within minutes. I do have highly reactive skin, I'm not sure what caused the reaction in this case possibly the alcohol. I would not recommend if you have sensitive skin. I have to say I was a little disappointed with this sunscreen. It goes on super duper smooth, as others have mentioned, but it stays rather greasy and shiny, unfortunately. It doesn't make my skin feel or look very good! Also the tinted thing is a bit of a stretch! Sure, the lotion itself is a brown colour, but it doesn't change my complexion at all (and I'm very pale). I'll use it now that I have it, but wouldn't buy it again, nor would I recommend it to a friend. This is the first time I've ever written a review on a product. I love this tinted sunscreen. It goes on silky smooth. You don't even know you have it on. The tint just slightly evens out my skin tone. This is one awesome multitasker. This sunscreen is great! It is amazingly light. Will be a fantastic summer moisturizer. Best sunscreen Iâ€™ve ever used. It glides on like velvet and turns instantly matte but not a dry matte - a silky matte - no shine, just glorious sun protection. The colour is very sheer - if you wear foundation this wonâ€™t replace your foundation, but it will make a stunning primer and it feels so good on the skin. Plus: VEGAN! My Holy Grail sunscreen has finally been found!